In an attempt to micro-manage everything, you might end up ruining more than you sort, and in the process, stressing yourself out. You wouldn't want to panic at the last moment, would you? Stress and panic during the final few days before the wedding will harm your skin in innumerable ways. You may end up getting tired skin with pimples. 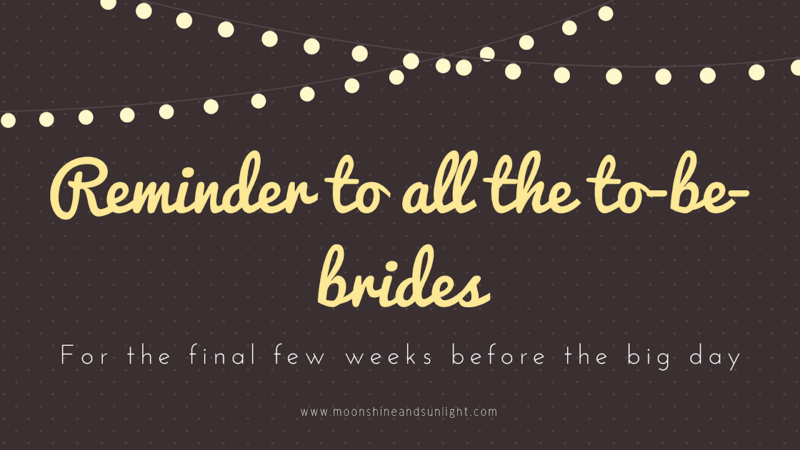 have fun at your wedding and enjoy every moment of it, even the planning! That way, every task will get due attention and will be completed on time. This will also reduce a lot of your stress. You can identify a few key people amongst family and friends and delegate work according to their strengths. moment might end up in your losing out on your dream idea completely. Complete all major shopping at least a month prior. Dont blindly use Instagram and Pinterest as your guidelines. Instead, use them for inspiration. Be practical about what is possible and what is not. to get all important nutrients, but do no skip meals. tired and missing spending time with your people. Now a days for a wedding everyone looking for wedding planners which include the sercices like Wedding photography, stage decoration, catering services, car decoration and everything. You enjoy the wedding day with hassle free wedding and make it memorable. very nice post.loved to read. keep posting such informative article. Very informative post this type of post i was searching thank you.